Get involved! Join the Two Rivers Coalition (TRC) - joining is simple with an online form! Learn more about TRC and help support protection and improvement efforts in the Black and Paw Paw River Watersheds. You can also follow the Two Rivers Coalition on Facebook! 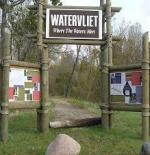 The Watervliet Urban Stormwater Demonstration Site is an example of Low Impact Development (LID) efforts in the PPRW. This site provides educational signage and features a porous pavement parking area. The PPRW Management Plan is intended to complement the Management Plans developed for the St. Joseph River and Lake Michigan. For more information, please contact Marcy Hamilton at (269) 925-1137 x1525 or hamiltonm@swmpc.org. What is the Transition Team? This page last updated on 3/13/2019. A sunny day on the Paw Paw River. 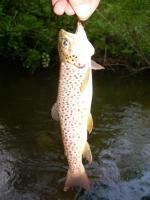 Brown Trout from the East Branch of the Paw Paw River.